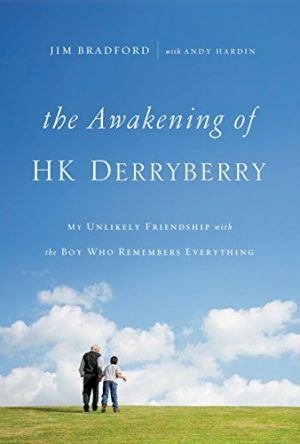 Jim Bradford’s new book “The Awakening of HK Derryberry, My Unlikely Friendship with the Boy Who Remembers Everything” is filled with stories, quotes and anecdotes that evoke belly laughs and tears, sometimes simultaneously. 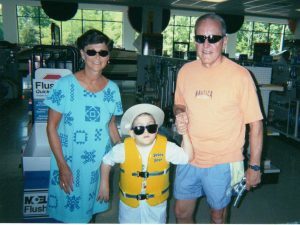 The book, released Sept. 13 by Thomas Nelson’s W Publishing Group, chronicles the longtime Brentwood resident’s relationship with a remarkable young man, HK Derryberry. Today the 26-year old charms audiences as a motivational speaker. But 17 years ago, HK was a lonely little 9-year-old who sat by himself in a Brentwood fast-food restaurant every weekend until his grandmother’s shift behind the counter ended. He whiled away the hours listening to an old transistor radio. On Saturday, Oct. 16, 1999, that changed. Jim Bradford, now 73, still doesn’t know why on that particular Saturday morning he decided to stop for coffee at Brentwood’s Mrs. Winners Chicken & Biscuits instead of his usual Starbucks after his weekly tennis match. By the time he headed for home, he had not only introduced himself to the boy who would change his life, he learned HK wasn’t just lonely. HK also was blind and had cerebral palsy. HK’s transformation into a confident young man would not have been possible without Jim’s friendship. And that friendship would not have been possible without the support and commitment of two very different women. HK’s paternal grandmother, Pearl “Grammy” Derryberry, has been his legal guardian since Oct. 11, 1990 — the day he left Vanderbilt University Medical Center’s NICU unit. Jim’s wife, Brenda Bradford, reluctantly came into HK’s life almost a decade later. But once she did, she never looked back. 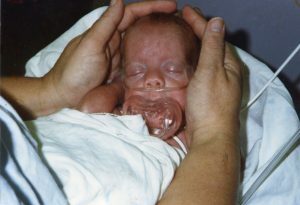 HK was born on July 8, 1990 birth by Cesarean section – three months premature. The day before, a one-car accident had left his 19-year-old mother on life support and his father, William Derryberry, with minor injuries. Mary Kay Moon Davidson died hours after her son was born. Pearl Derryberry was 45 when she took HK home. Today she’s 71. Though HK has earned his high school diploma, been tagged the “Best Blind Skier Ever” and with Jim has launched a professional speaking career, his multiple physical limitations will always require 24/7 personal assistance. Pearl isn’t certain who will eventually take over that role. “When that time comes, God will provide,” Pearl said. The fiercely independent, strong-willed woman who has overcome a lifetime of obstacles likely will not see that time come anytime soon. “What keeps me going is that I made him a promise in the NICU that if he would fight to survive, I would spend the rest of my life trying to make his life better,” Pearl said. “I am just trying to keep my promise. 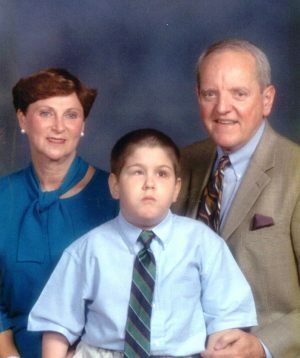 When Jim first came into their lives, Pearl could not have fathomed what the future held for her grandson. Weekly visits in the Mrs. Winners dining room evolved into Saturday field trips to places like B&C Ace Hardware. Later Jim started picking HK up at Pearl’s East Nashville home on Sunday mornings so he could attend Harpeth Hills Church of Christ with the Bradfords. When HK was 11, Pearl agreed to let HK spend Saturday nights in Brentwood, saving Jim the drive. Over the years, the weekly overnights grew to include weekend trips to the Bradfords’ lake house and in 2006, HK’s first beach vacation. A self-described loner, Pearl admits she has “never been one who has had a lot of friends.” But she has grown to enjoy her personal time when HK is away, though he’s never far from her mind. “I still to this day like to get a call before he goes to bed for the night or when they are traveling. I want to know when the reach their destination, especially if they are flying. I sleep better knowing ‘all is well’,” she said. Life has never been easy for Pearl. She married early and had two sons within two years. When she realized her husband was never going to be a responsible husband or father, she left him, returned to Tennessee and let her parents raise the boys in Maury County, while she lived and worked in Nashville. She visited her sons every weekend but admits she wasn’t a hands-on parent. HK gave her a second chance, one that wouldn’t have been possible without the decisions made by his other grandmother after the accident. Mary’s mother had legal standing over William since the couple wasn’t married. The biggest decision Mary made was to try save the baby, who doctors said was small but viable. If Mary’s mother had decided otherwise, “there wasn’t a thing we could have done,” Pearl said. “I will always be truly grateful,” Pearl said, despite the fact that the two grandmothers later went to court to determine who would be granted custody. A Nashville judge ruled in Pearl’s favor. “Once HK got to leave the hospital, we’ve not heard from her since,” Pearl said. The ensuing years have not been easy. 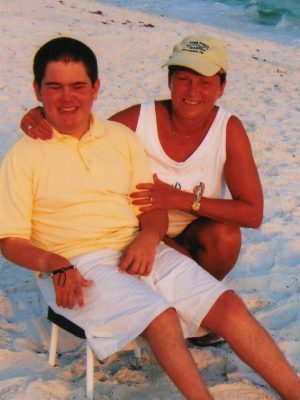 Many of the challenges Pearl faced caring for her disabled grandson are detailed in Jim’s book. Despite obstacles, Pearl always kept HK’s education, medical care, and well-being front and center. She enrolled him at the Tennessee School for the Blind when he was 3 and a half. She lobbied for and the school purchased two one-handed Braille machines – one for the campus, one for homework — so HK could complete his assignments. A stroke soon after his birth had paralyzed his right arm. She stood taller than her 5-foot frame on June 1, 2012 when HK, a month shy of his 22nd birthday, graduated from Tennessee School for the Blind with an academic diploma rather than an attendance completion certificate. That same year, the scientific journal Neurocase published results of a Vanderbilt study of HK’s brain and his extraordinary ability to recall dates and times. As HK’s accomplishments continue to grow, she stands even taller. “HK’s being able to realize his dream of being an advocate for people with disabilities is one of the things I’m most proud of,” she said. In June, he was named a celebrity ambassador for United Cerebral Palsy’s STEPtember 2016 benefit. Pearl’s son and HK’s father William has been in and out of their lives since HK’s birth, but never as a true father figure. “We love him, but we don’t like him sometimes,” HK stated with little emotion. Among the many activities that fill their weekly calendar, HK and Pearl attend Al-Anon meetings to help them cope with and understand William’s alcoholism. “She’s the best grandmother anyone could have,” he said. While Pearl fought for custody of HK, Brenda Bradford needed time to warm to the idea of adding a new member to the family, even on a very part-time basis. As related in Chapter 13, titled “Brenda’s Surprise,” it took Jim almost a year to find the courage to introduce HK to his wife. The initial surprise didn’t go exactly as Jim and HK had planned, but all turned out well in the end. “It is true that I was hesitant to meet and get involved with HK. Our daughters were both gone from home and I had lost both my mother and brother in the last two years. I was comfortable in my life and enjoying my free time,” Brenda explained. As late 1999 turned into 2000, however, she began to recognize how much Jim enjoyed spending time with and talking about his young friend. “I could sense that HK would drastically change my life,” Brenda said. “And that’s exactly what happened.” She was soon under HK’s spell too. When it became clear that HK was going to be a regular presence in their lives, Brenda did make one ultimatum. Jim had to reserve his Friday nights for her and adult-only activities. Being a wise man, Jim agreed. In April, the Bradfords celebrated their 50th wedding anniversary. And they still have date nights every Friday. Brenda has not established any special one-on-one time with HK, knowing how important his time is with Jim. “It’s either the two of them or the three of us,” she said. Being left out of the equation doesn’t faze her, however. “I’m a pretty independent person and the word boredom is not in my vocabulary,” she said. “I love music, enjoy reading, playing cards, puzzles, traveling and, like most women, shopping. And, I very much enjoy some time alone. “I’m one who will go to dinner or a movie by myself. So when they are out doing ‘whatever they do,’ I’m OK. Through the years, Brenda has done countless things to enlarge HK’s life, like fulfilling his dream of experiencing a beach vacation. He celebrated his first Christmas with gifts and decorations at the Bradfords. HK has enriched Brenda’s life as well. In addition to loving his “positive attitude, his open honesty and his bubbling personality,” Brenda said HK’s ongoing presence in their lives has been educational as well. “I hope all who read the book laugh and cry and feel inspired to do something for someone less fortunate,” she said. She also hopes those who read it will recommend it to others. All of the book’s proceeds, just like the professional speaking fees HK and Jim now collect, are directed to a trust fund Jim established to financially support HK in the years ahead. After reading the finished product, Brenda said Chapter 33, “King of the Prom,” is probably her favorite. “It is a testament to the determination and effort HK put into receiving his high school diploma after being told he would not be able to do that,” she said. “It was a big accomplishment for him and it was special that William, his dad, was able to attend and was very proud of him. “That chapter also highlights his popularity with his peers as he was crowned ‘King of the Prom.’ That was a special night for him,” she said. It was also a night she and Jim were able to share in a small way. They accompanied HK and his date on the bus to a prom-night dinner they enjoyed before traveling back to the Tennessee School for the Blind’s Donelson campus for the big event. The story of HK Derryberry and Jim Bradford has captured many people’s attention. 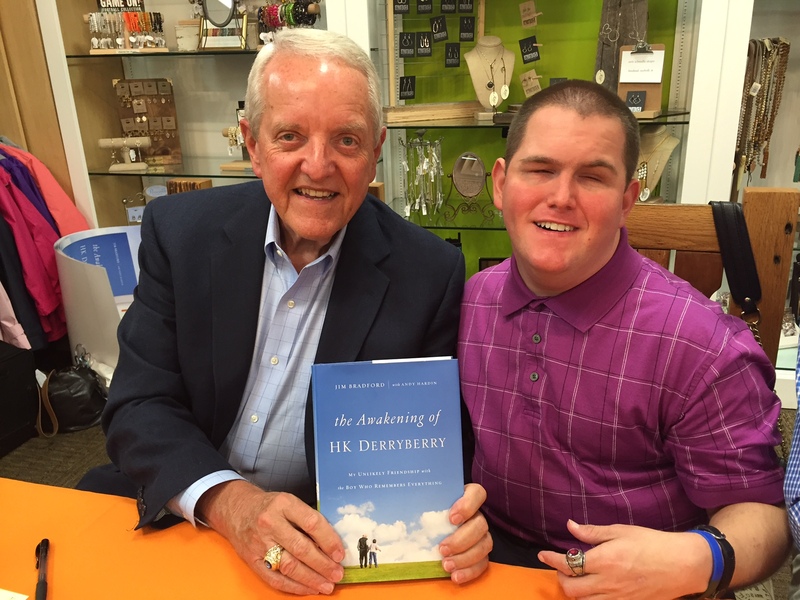 “The Awakening of HK Derryberry, My Unlikely Friendship with the Boy who Remembers Everything” initial printing sold out prior to its Sept. 13 national launch. Locally, the hardcover book ($24.99) is available at local Barnes & Noble stores, Parnassus Books, 3900 Hillsboro Pike, Suite 14, in Green Hills, and Katy’s Hallmark in Brentwood’s Hill Center. It is available in hardback, Kindle and audio editions at most online booksellers. Jim and HK will be front and center on Nov. 6 when Parnassus hosts a book signing. But look behind the table, and you’ll find the two women who have had an immeasurable impact on HK’s life, albeit in different ways and at different times, standing in support of the unlikely friends with an amazing story to share. Susan T. Leathers co-founded Brentwood Home Page in 2009 and served as its editor until 2014. Contact her at stleathers@gmail.com.